Just picked up a UTR for a 2018 Q7. I'll try to post pictures as I go along. Essentially there is a body harness adapter cable which taps into power from the connectors at the rear view mirror. Then the UTR cable connects to the adapter cable. The UTR cable is then routes along the headliner, dwn the apillar (not in front of the air bag) into the footwell and then along the sill plate to the rear c-pillar and up to the rear headliner, snaked onto the left side rear hatch hinge and then eventually to the top middle of the read hatch for the rear camera. I am not quite sure hot to remove the driver's side A-pillar and driver's side rear C-pillar. 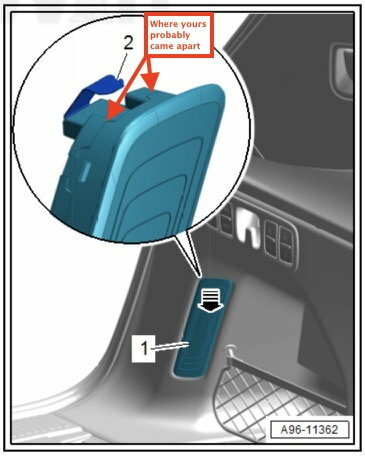 Also I would like to know how to the remove the driver's side cargo side panel. Could someone post diagrams of these items or suggest where I can purchase the appropriate manual which provides removal diagrams/instructions? Go to Erwin.audiusa.com, sign-up for a one day subscription for $35, and download any/all docs you like. You'll find all install/removal manuals there (and more). I have been able to remove the following interior pieces. Cover for the rain sensor, and smaller middle section cover which hides the wire for the rear view mirror. a-pillar panel, side dash cover, a-pillar mid section cover, foot well cover for the hood release lever. Sill plate cover from front to rear, tailgate upper trim cover, and the rear upper headliner cover. Has anyone removed the following cover ? (these are the cover remaining which I haven't been able to remove yet) The interior wheels housing cover, c-pillar cover (seem like the wheels housing and c-pillar cover are one piece ) . Essentially I need access to the floor along the left rear wheel housing and be able to route the wire up the c-pillar to the roof. Any suggestions / tips on removal would be appreciated. I'll have photos of the install posted when I finish the project. There are other pics and info from others in that thread too. Thanks, Great write up and install of your camera. I essentially did the same thing. Once I had the wire to the rear of the rear sill cover I ran the wire along the edges of the floor area until I reached the area under the third row seats. From there I continued to tuck the wire behind the perimeter of the panel/hatch rubber until I reach the top of the hinge. I then brought the wire along the route were the existing cable run is so it won't experience too much stress when the hatch opens and closes. One thing though I knocked off the wire that goes to the LED cargo light on the left rear lower area (ugh). I'm not sure how I can reconnect it. I thought about making a short extension jumper because I know I can fish that through to the connector in the cargo area where there is more room to re-make the connection. Otherwise it seems impossible to reconnect the wire (yes, I popped the led light off, didn't damage it and I can put it back on with care) I'll try to remove the ride height/seat switch panel and see if I can reach the bottom of the LED light where the two-wire connector connects to the LED module. I haven't mounted the cameras yet. I'm struggling to decide if I should place the camera on the passenger side (right side) or the driver's side (left side) of the rear view mirror. If I mount it on the passenger side then the rear view mirror will "hide" the camera and it isn't too visible from the drivers seat. If mounted on the driver's side of the rear view mirror then it is more visible from the driver seat but the lens of the camera will be in the center of the windshield, whereas if mounted on the passenger's side the camera lens will be offset about 4" from the center of the windshield. So far I am leaning towards placeing it on the drivers side. There is enough cable at the roof liner to place the camera mount on either side of the rear view mirror. I'm not sure I'm quite understanding about the cable to the LED cargo light. If you are able to carefully remove that light without it coming apart, then you should be able to just plug the cable back into it. If the light comes apart like mine did, then it's a royal pain to get all the parts lined up to snap it back together so that the cable socket is still functional. However, it can be done with patience. I popped out the LED module and its housing is still in the panel. I'm not sure how the housing comes out of the panel. If I can get the housing out of the panel then, yeah, I can bring the wire connector up the cut-out, connected back the LED module, snap it back together and hopefully pop it back in. But I'm not sure how the housing is removed from the panel. Right now the wire is unclipled from the socket and fell down into the cargo area below. There isn't any access room to just plug the cable back in. Last edited by BlackOptics; 07-27-2018 at 09:02 AM. Thank you for starting the thread and if you can post some pictures of your progress. I ordered the UTR some months ago (Q7 is still on order) and didn't realize it came with nothing in the box but a flimsy booklet with no install manuals. Reached out to the vendor (Audi dealer in UK) but am not expecting much. What you're describing sounds like what happened to me... the light unit came apart when you tried to get it out. If done properly, the entire unit comes out leaving just a hole. The housing that you are describing as still being in the panel is not actually the lamp housing but rather an integral part of the lamp unit and not intended to be separated from the rest of the lamp. However, it's very easy to have the back of the lamp housing separate from the front of the lamp and remain in the hole. Sounds like this is what happened. If yours did in fact come apart, now you have to get the back portion out of the hole by depressing the clip at the top per the illustration. You will find that the copper contacts that touch the circuit board of the lamp are sticking out of the cable's plug. You will need to pull that piece out. It will look like two copper prongs that go through a small 2-3mm plastic block. One pair of prongs is longer and straight, the other end is shorter and curved. The straight end ends up being the receptacle for the plug and the curved end ends up touching the circuit board of the light. Once you have the little piece out, you have to lay it down so the curved contacts touch the circuit board in the right place and then carefully re-assemble the light unit. It's tricky to get everything to line up and make good contact, but it can be done. Once it is re-assembled, you should have one solid lamp unit that the cable plug can be inserted into. I've done my best to try to describe what it looks like. A picture would be worth a thousand words, but I'm not going to take mine apart to take photos. However, if you would post some photos of what you're seeing, I can certainly try to describe in more detail how I got mine back together if it would help. I will post pictures of the LED module and lower half of the light unit still in the panel. Your post is perfect and I understand what need to be done. Thank you! Last edited by BlackOptics; 07-27-2018 at 10:16 AM.